Growing up, I cut my tabletop teeth on miniatures games. Warhammer, 40K, Heroclix, and Warmachine. It’s a hobby that’s since given way to other pursuits, but will always be in my heart. 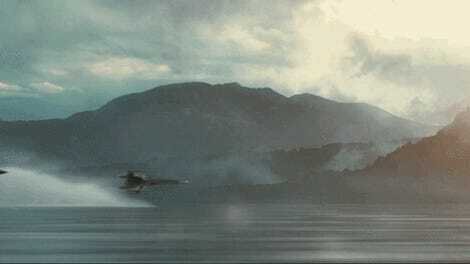 It’s probably also clear at this point that I love X-Wings an awful lot. And yet, I’ve spent the past five years avoiding one of the best miniatures games around centered specifically around them. Fantasy Flight Games launched X-Wing in 2012—loosely based around the mechanics of its 20th Century dogfight game Wings of War—and despite the fact it should be a match made in tabletop heaven for me, I’ve resisted even so much as looking in the direction of a shelf of models ever since. Because, perhaps wisely, I knew that the minute I actually tried the game I would not be able to resist getting into it, and tabletop games can be a very expensive hobby. Especially X-Wing, when a new ship can cost you anywhere from around $12 for a basic ship like an A-Wing or a TIE Bomber, to up $40 for some of the bigger models like the Millennium Falcon or an Imperial Shuttle, all of which are pre-painted and look so good you might just end up buying some just to display. Last weekend, I tried X-Wing for the first time. Readers, I went overboard. Immediately. None could board more overly than I.
I tried sticking to Resistance-era ships to limit my madness. It... did not work. This is a frankly ludicrous amount of models—more than an average game of X-Wing will actually allow you to use—and in all honesty, instead of diving in head first like a madman as I did, if you’re intrigued by X-Wing your best bet is to start with the “Core” Set. 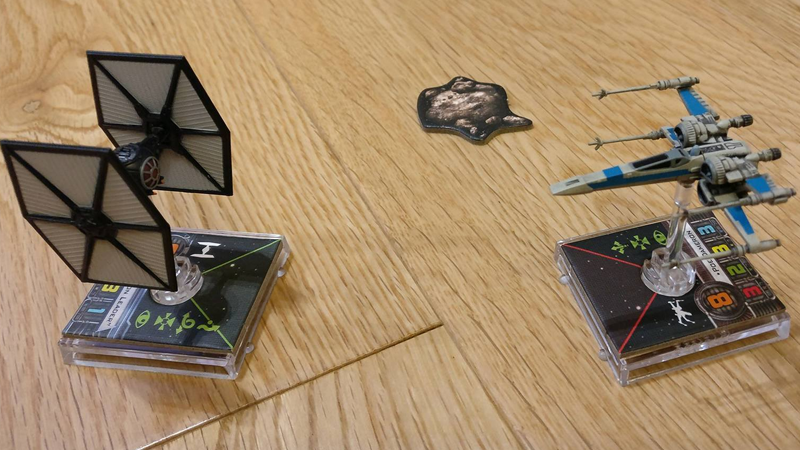 It comes with three models, an X-Wing and two TIE Fighters, cards to kit out those models with the appropriate pilots and gear, and all the dice and rules you’ll need to start playing. There’s even an alternate The Force Awakens edition that replaces those models with the updated Resistance and First Order vehicles, and updates the cards to include pilots from the new movies. But whether you’re starting off small or going all-in with a full squadron you’ve kitted out to your exact liking, the fact remains: X-Wing is a fiendishly good recreation of the intensity of Star Wars space combat. How? Primarily with an intimate sense of scale. A game of X-Wing is started by picking your side, then picking the ships you’ll bringing into combat, or more specifically, the pilots those ships will have. A usual game features squads worth 100 points each, and the primary value of a ship is decided by the value of its pilot—you could field an X-Wing with a generic unnamed rookie and have points to spend on extra gear for it like torpedoes or an astromech unit that could let you re-roll a failed combat dice, or you could put Poe Dameron or Luke Skywalker in the cockpit, who might have better stats or special abilities, but have a higher base cost in exchange for that. Some of the pilots and extra abilities you can equip the Millennium Falcon with. Han Solo costs a lot of points, obviously. Even if you go as basic as possible with no extra frills on your ship, the point system means you’ll never have more than five or six ships on your side in a match, and often less than that (the Empire has the potential to have more, because ships like the TIE Fighter cost less—because they don’t have shields so they’re more “expendable”). Once you’ve sorted your team and are finally ready to start, each player picks a specific movement for each of their craft to execute, selected on a small wheel unique to each class of ship, and keeps it hidden until it’s time for everyone to reveal their maneuvers all in one go, and move their ships across the battlefield. The secrecy of it all means you never really know where your opponents ships will be heading until everything’s kicked off already. Attacking—or trying to evade your opponent’s attacks—is where the extra gear you could’ve equipped before the game started comes into play, influencing the dice roles that govern if your attacks hit or miss, or if you shrug off a volley of blaster bolts from your enemies. Starting off, you might only have basic pilots and little gear, so it matters less—just roll some dice and hope you hit something. But once you start learning the more advanced rules of the game, and how certain pieces of gear work with your ships and play-style, X-Wing can become almost alluringly intense to play, as you weigh dozens of tactical choices in your head like you’re Jan Dodonna on speed. The small number of ships in play, combined with the random-chance potential frenzy of combat makes X-Wing battles feel ripped right out of the movies—and because of that, every small action, whether it’s performing a tricky maneuver, trying to repair damage to a system on your ship, or actually shooting at an opponent feels significant to the flow of a game. Your never just idling waiting for something to happen, And given that most of those actions are up to chance dice rolls, when you’re stuck into a midst of game it can make for some paralyzing, hectic decisions. There’s just enough chance involved that it never feels too overwhelming for a new player, but just enough tactical skill that pulling off a tricky movement to narrowly avoid crashing into something or lining up the perfect volley of blaster fire feels as satisfying as actually destroying a ship or winning a game. X-Wing allows you to revel in the art of piloting a ship, like it’s an elaborate dance instead of a laser-filled battle to the death. X-Wing taps into the visceral fantasy of being a starfighter ace in the Star Wars in a way that feels quick-paced enough to really capture the chaos of spaceship dogfights while also being tactically deep enough that the strategy keeps you coming back for more. It’s an experience that leans on its tangibility, from the gorgeous models to the specificity of each maneuver template you use, to the point that you really can get sucked in. You can play it on basically any flat surface, but you’ll want to buy a play mat with some stars on or with Yavin IV in the background. You’ll want to make a Spotify playlist of John William’s finest to provide an even Star Wars-ier vibe. You’ll even want to inadvertently cry “They came from... behind!” when some upstart rookie blows up your tricked-out ace pilot with a lucky shot. It so gleefully captures what makes Star Wars fights so enchanting that anything less than going all-in, S-Foils locked in attack position, feels impossible (okay, I may be justifying my rapid addiction a little too much there). Not Included: The sound of me making fwooshing and laser gun noises. Plus, did I mention that the models are really cool?